Summary: San Francisco, 1906: Fifteen-year-old Mercy Wong is determined to break from the poverty in Chinatown, and an education at St. Clare’s School for Girls is her best hope. Although St. Clare’s is off-limits to all but the wealthiest white girls, Mercy gains admittance through a mix of cunning and a little bribery, only to discover that getting in was the easiest part. Not to be undone by a bunch of spoiled heiresses, Mercy stands strong—until disaster strikes. Mercy has ambitions and the know-how. She has thoroughly studied The Book for Business-Minded Women by a woman named Mrs. Lowry who has achieved hero status in Mercy’s eyes. Mercy’s prepared to work hard and make sacrifices to achieve her goal, but her ambitions are not only for herself. She wants to succeed so her father won’t have to work sixteen hour days and her little brother, who has health issues, won’t have to follow in his father’s difficult footsteps. Her dreams are big, but her family’s comfort and health is what inspires her and keeps her moving forward. Mercy has a long way to go make her dreams come true though. She realizes that the key to becoming wealthy is opportunity. Having been born into poverty in Chinatown, Mercy has a short supply in the area of opportunities. “And if opportunity didn’t come knocking, then Mrs. Lowry says you must build your own door.” Mercy sets about building those doors which involves much scheming, plotting and more than a few adventures. I loved the adventures. There are even hot-air balloon rides. Along the way, Mercy makes connections with people from many different backgrounds. I loved meeting the unique characters and didn’t want to say good-bye. I’m hoping there will be a companion novel or even a sequel so we can meet them again. In addition to the many young women in the story, there is a love interest. Mercy has loved Tom for quite some time, but there are complications and he is moving far away. I appreciated that there’s a romance in the story, but it’s not the main focus of the novel. Mercy has many different things going on in her life and he is important, but is just one of her concerns. Recommendation: Get this one as soon as you can especially if historical fiction is your thing. Stacey Lee is a wonderful storyteller. She does a fabulous job bringing the setting to life and she creates memorable characters that are sure to steal hearts. Oh, and you might need a tissue once in a while. I’m going to be in Portugal when Outrun the Moon launches, and I’m ordering it to be sent to me there. I’ve been waiting for this one for a long time. I just received a giveaway copy from you this week- thank you! Your review has me even more excited to read Outrun the Moon. Mercy sounds like an awesome heroine. I love historical fiction and Stacy Lee’s prior book. Thanks for the “Pre-order special,” link. thanks so much for previewing this book, showing cover. I wanted to read a good library YA or middle grade historical novel set in San Francisco. What I borrowed was “City of Dragons” by Kelli Stanley. a noir mystery that was v. bigoted, cruel. but it still didn’t feel like San Francisco. Or that narrator (white Catholic lady detective) cared about any POC or minority cause, anyone’s problems but her own loneliness, misery. Detective was paid + assigned to investigate 2 murders! She witnessed graphic violent crime, saw much oppression, class warfare, social injustice all around her! “City of Dragons” main chara had ability, money, time, obligation, connections, etc to help many but chose not to assist NOBODY. can’t recommend Kelli Stanley “City of Dragons” to anyone. to part quote a Jedi Master: [City of Dragons] is not the [book] you’re looking for. 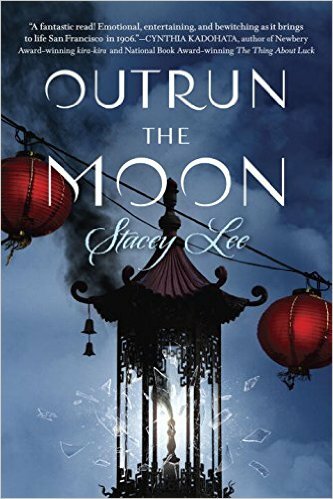 “Outrun The Moon” by Stacey Lee is the cultural book to request instead! many thanks to your blog. I will get Stacey Lee’s new book soon as I can.